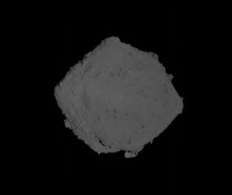 Hayabusa-2 has begun its approach to Ryugu, aiming for a quick touchdown and sample grab at approximately 7:06 pm (Eastern) tonight. The image at the right is the most recent taken during the approach. During the scheduled time for touchdown in late October, we did not touchdown but descended and dropped a target marker near the intended landing site. We were able to drop the target marker in almost the planned spot and afterwards we examined the vicinity of the target marker landing site in detail. Finally, the area denoted L08-E1 was selected as the place for touchdown. From the first link above you can see approach images as they are downloaded today, about once every half hour.